get 'em while they's hot! My sweet sister Bethany inspires me with her amazing creativity and talent (my sister Steph and sis-in-law Jess are equally brilliant, but I’ll save them for another post). Then she double-inspires me by giving so much to others, especially those in need. Today, she’s on a mission. To sell these 2 FABULOUS fabric banners and 1 GORGEOUS apron to buy a GOAT for a family in poverty in a third-world country this Christmas. So, if you buy one of these one-of-a-kind handmade items today, you’re getting something REALLY cool and essentially buying 1/3 of a GOAT. Kinda hard to pass that one up, eh? EDIT: Check out my cousin Jen’s Elf/Goat Party. AWESOME idea anyone could do!! Item #1: Polka-dotted C-E-L-E-B-R-A-T-E banner– $42 $35 (shipping included–U.S. addresses only) SOLD!! Thanks, Valerie! 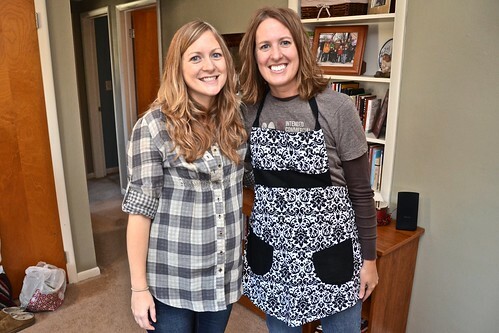 Item #2: Black-and-white apron– $32 (shipping included–U.S. addresses only) SOLD!! Thank you, Rachelle! 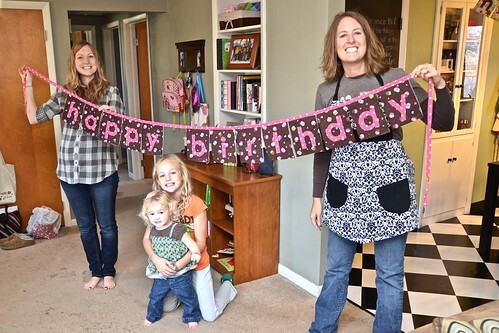 Not for sale: Isabelle’s b-day banner (she shares a b-day, but not a b-day banner, with Uncle Gabe). Also not for sale: Bethany’s adorable kitchen. 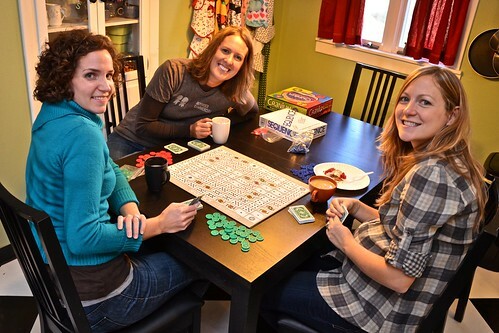 The sisters playing one of our new favorite games (Sequence). I didn’t win once. We missed you, Steph! 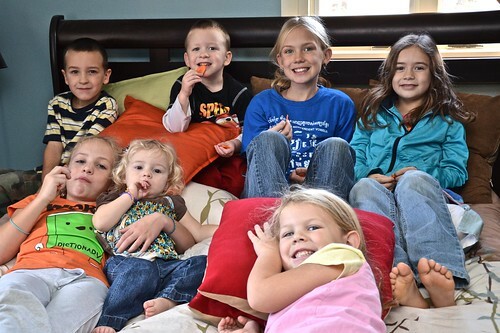 All the cousins (minus little Mia in South Carolina) huddled on Uncle Stew and Aunt Bethy’s bed watching the Grinch. p.s. My apologies for no blog post yesterday. Only 6 days old, and December is already kicking my tail. Neighborhood Cookie Party details to come! p.p.s. It’s not too late to sign up for our next Read-Along! We’d love to have you! 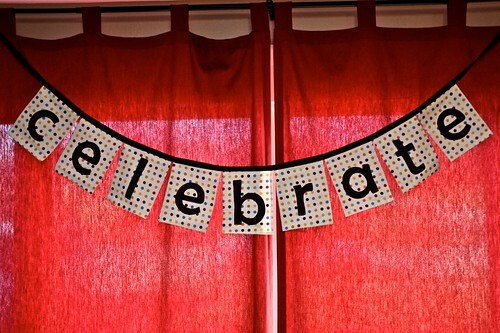 Marla, I want to buy the polka-dot Celebrate banner. Yay! I was debating…should I, shouldn’t I? But realizing that the money spent is not JUST to buy something for myself, but to help a family in need….YES, I should! Thanks Marla and Bethany! Bless you, Valerie!! I’ll have Bethany get in touch with you about payment/shipment. Thank you SO much! Thanks Valerie! Please email your shipping address to me at bethanypeters22@yahoo.com. 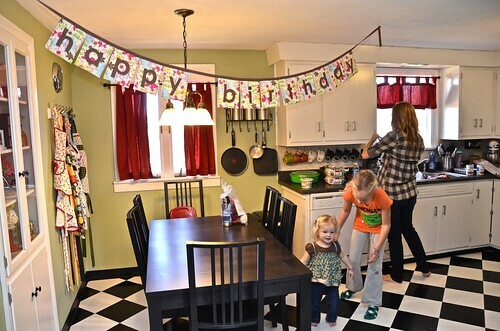 I want Bethany’s kitchen……and her little girl…. Side note: Marla, your hair is super cute that length. Thanks, Jen. The plan is to grow it out for Locks of Love (Jess inspired me), but it could take years. We’ll see! SOLD! I love you, Rachelle. I LOVE the banners and will be buying one one day, just not right now :(……… Does your sister have an etsy site? I looked through all of these pictures at least four times. How can a few pictures make me so happy and so sad at the same time? We can’t wait! Love you! !